Is leaking treason? Snowden, Manning, and Miranda are accused of terrorism and aiding the enemy. Snowden, Manning, and Miranda leaked government secrets. Does that make them traitors and terrorists? 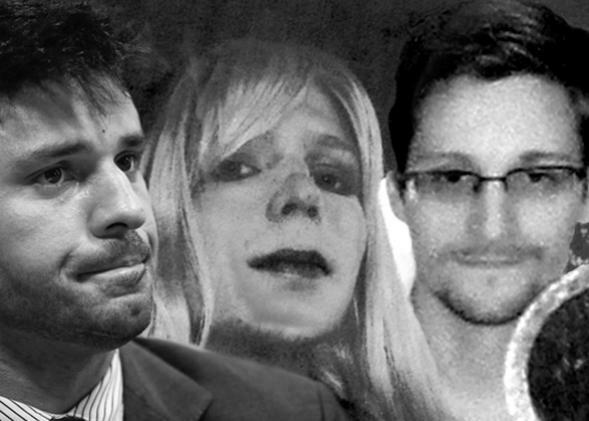 David Miranda, Chelsea Manning, Edward Snowden. Photo illustration by Lisa Larson-Walker. Photos by Reuters. Twelve years, two wars, and one president later, we’re still enforcing that policy. In fact, we have escalated it. Anyone who leaks classified documents that expose government surveillance is accused not just of violating secrecy laws, but of serving the enemy. reached out to reporters after the public revelations about China’s surveillance of the [New York] Times’s computers and the years of hacking by [the Chinese military] into networks used by American businesses and government agencies. On May 24, in an email from Hong Kong, Snowden informed a Washington Post reporter to whom he had given documents that the paper had 72 hours to publish them or he would take them elsewhere; had the Post complied, its story about American computer spying would have run on the day [U.S. National Security Advisor Tom] Donilon landed in Beijing to push for Chinese hacking to be on the agenda for the presidential summit. After fleeing to Hong Kong, [Snowden] provided local reporters with NSA documents and told them the United States was hacking major Chinese telecommunications companies, a Beijing university and the corporate owner of the region’s most extensive fiber-optic submarine cable network. That information, government officials and industry experts say, is now used by the Chinese to deflect criticisms of their hacking, both in meetings with the administration and at cyber security conferences. Manning, Miranda, and Snowden are different in many ways. But two things unite them. First, they have all participated in the transfer or release of secret government documents. Second, for doing this, they have been accused, through formal charges or insinuation, of collaboration with enemies of the state. In Manning’s case, the indictment hinged on the sheer fact that the global public “included” our enemies. In Miranda’s case, the British government argued that disclosure of surveillance programs would help terrorists evade them and thereby “endanger people’s lives.” In Snowden’s case, the suggestion is that because his leaks exposed U.S. hypocrisy about espionage, they served China’s nefarious interests deliberately or—wink, wink—in a remarkable coincidence. In none of these cases has the government presented any evidence that the leaker intended to aid, or had any contact with, our adversaries. The rationale is simply that our adversaries benefit from disclosures of classified information. That argument is true, but it’s far too broad. It defines all leaking not simply as a crime, but as treason. It insults the meanings of espionage and terrorism. It endangers us all.